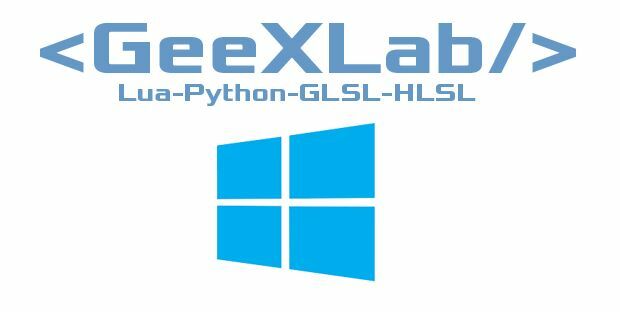 A minor update of GeeXLab is available for Windows 32/64-bit. This update of GeeXLab comes with a new function for true type fonts (gh_font.text_2d_v2()) that makes it possible to display words with different colors. The kx framework (Lua) has been fully re-written and now loading one file (kx.lua) is enough to use the framework (in previous version there was a file to load for OpenGL demos and another one for Vulkan demos). Some demos of the code sample pack have been updated with the kx framework. As usual, you can download GeeXLab and the code sample pack from THIS PAGE. + added text_2d_v2() to gh_font (lua / python).
! updated the Lua kx framework used in OpenGL and Vulkan demos.
! updated all vk/normal-mapping/ demos with new kx framework.
! updated vk/shadertoy/ demo with new kx framework.
! updated all gl-32/voxelize/ demos with new kx framework.
! updated all gl-21/shadertoy-02/ demos with new kx framework.